The Capitoline Hill (/ˈkæpᵻtəˌlaɪn, kəˈpɪ-/; Latin: Collis Capitōlīnus [ˈkɔllɪs kapɪtoːˈliːnʊs]; Italian: Campidoglio [kampiˈdɔʎʎo]), between the Forum and the Campus Martius, is one of the Seven Hills of Rome. 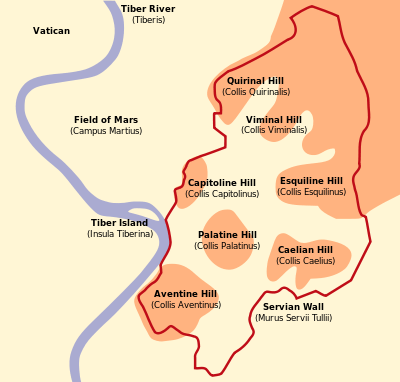 It was the citadel (equivalent of the ancient Greek acropolis) of the earliest Romans. The name capitol seems to have meant "dominant height", although ancient tradition places its origin in caput ("skull": a specific skull found while laying the Temple of Jupiter foundation). By the 16th century, Capitolinus had become Capitolino in Italian, with the alternative Campidoglio stemming from Capitolium, one of the three major spurs of the Capitolinus (the others being Arx and Tarpeius). The Capitoline contains few ancient ground-level ruins, as they are almost entirely covered up by Medieval and Renaissance palaces (now housing the Capitoline Museums) that surround a piazza, a significant urban plan designed by Michelangelo. The English word capitol derives from Capitoline. Capitol Hill in Washington, D.C. is widely assumed to be named after the Capitoline Hill, but the causation is not crystal clear. The Tabularium, located underground beneath the piazza and hilltop, occupies a building of the same name built in the 1st century BC to hold Roman records of state. The Tabularium looks out from the rear onto the Roman Forum. The main attraction of the Tabularium, besides the structure itself, is the Temple of Veiovis. 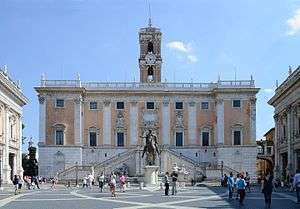 During the lengthy period of ancient Rome, the Capitoline Hill was the geographical and ceremonial center. However, by the Renaissance, the former center was an untidy conglomeration of dilapidated buildings and the site of criminal executions. The bird's-eye view of the engraving by Étienne Dupérac shows Michelangelo's solution to the problems of the space in the Piazza del Campidoglio. Even with their new facades centering them on the new palazzo at the rear, the space was a trapezoid, and the facades did not face each other squarely. Worse still, the whole site sloped (to the left in the engraving). Michelangelo's solution was radical. The three remodelled palazzi enclose a harmonious trapezoidal space, approached by the ramped staircase called the "Cordonata". The stepped ramp of the cordonata was intended, like a slow-moving escalator, to lift its visitors toward the sky and deposit them on the threshold of municipal authority. Since no "perfect" forms would work within the dimension of the plaza, his apparent oval in the paving is actually egg-shaped, narrower at one end than at the other. The oval shape combined with the diamond pattern within it was a play on the previous Renaissance geometries of the circle and square. The travertine design set into the paving is perfectly level: Around its perimeter, low steps arise and die away into the paving as the slope requires. Its centre springs slightly, so that one senses that he/she is standing on the exposed segment of a gigantic egg all but buried at the centre of the city at the centre of the world, as Michelangelo's historian Charles de Tolnay pointed out. An interlaced twelve-pointed star makes a subtle reference to the constellations, revolving around this space called Caput mundi, Latin for "head of the world." This paving design was never executed by the popes, who may have detected a subtext of less-than-Christian import, but Benito Mussolini ordered the paving completed to Michelangelo's design in 1940. Michelangelo looked at the center to find a solution to the Capitoline disorder. The statue provided a center and a focus. The buildings defined the space, and it is this space as much as the buildings, that is the impressive achievement of the Capitoline complex. It is a giant outdoor room, a plaza enclosed and protected but open to the sky and accessible through five symmetrical openings. 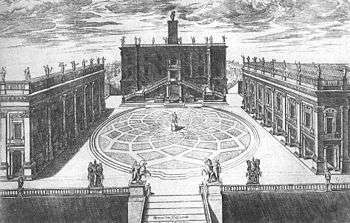 Axiality and symmetry govern all parts of the Campidoglio. The aspect of the piazza that makes this most immediately apparent is the central statue, with the paving pattern directing the visitors’ eyes to its base. Michelangelo also gave the medieval Palazzo del Senatore a central campanile, a renovated façade, and a grand divided external staircase. He designed a new façade for the colonnaded Palazzo dei Conservatori and projected an identical structure, the Palazzo Nuovo, for the opposite side of the piazza. On the narrow side of the trapezoidal plan, he extended the central axis with a magnificent stair to link the hilltop with the city below. He provided new fronts to the two official buildings of Rome's civic government, the Palazzo dei Conservatori, the Senatorio, and finally the Nuovo. Michelangelo designed a new façade for the dilapidated Palazzo dei Conservatori and he designed the Palazzo Nuovo to be a mirror complement, thereby providing balance and coherence to the ragged ensemble of existing structures. The building of these two buildings were carried out after his death under the supervision of Tommaso Cavalieri. The sole arched motif in the entire Campidoglio design is the segmental pediments over their windows, which give a slight spring to the completely angular vertical-horizontal balance of the design. The three palazzi are now home to the Capitoline Museums. The Palazzo dei Conservatori ("Palace of the Conservators") was built in the Middle Ages for the local magistrate on top of a sixth-century BC temple dedicated to Jupiter "Maximus Capitolinus". Michelangelo's renovation of it incorporated the first use of a giant order that spanned two storeys, here with a range of Corinthian pilasters and subsidiary Ionic columns flanking the ground-floor loggia openings and the second-floor windows. Michelangelo’s new portico is a reinvention of older ideas. The portico contains entablatures and a flat, coffer-like ceiling. The entablatures rest on columns set at the front of each bay, while matching half-columns stand against the back wall. Each pilaster forms a compound unit with the pier and column on either side of it. Colossal pilasters set on large bases join the portico and the upper story. All of the windows are capped with segmental pediments. A balustrade fringing the roof emphasizes the emphatic horizontality of the whole against which the vertical lines of the orders rise in majestic contrast. The verticality of the colossal order creates the feeling of a self-contained space while the horizontality of the entablatures and balustrades emphasize the longitudinal axis of the piazza. The palazzo’s facade was updated by Michelangelo in the 1530s and again later numerous times. In Rome the portico of the Palazzo dei Conservatori sheltered offices of various guilds. Here disputes arising in the transaction of business were adjudicated, unless they were of sufficient importance to go before a communal tribunal, such as that of the conservatori. It was a natural place for such activity. 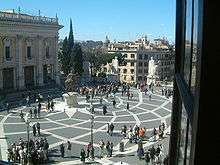 Until the 1470s the main market of the city was held on and around the campidoglio, while cattle continued to be taxed and sold in the ancient forum located just to the south. Built during the 13th and 14th centuries, the Palazzo Senatorio ("Senatorial Palace") stands atop the Tabularium, which had once housed the archives of ancient Rome. Peperino blocks from the Tabularium were re-used in the left side of the palace and a corner of the bell tower. It now houses the Roman city hall. Its double ramp of stairs was designed by Michelangelo. This double stairway to the palazzo replaced the old flight of steps and two-storied loggia, which had stood on the right side of the palace. The staircase cannot be seen solely in terms of the building to which it belongs but must be set in the context of the piazza as a whole. The steps, beginning at the center of each wing, move gently upward until they reach the inner corner, level off and recede to the main surface of the façade. They then continue an unbroken stateliness toward each other, converging on the central doorway of the second story. This interruption of the diagonal line and the brief inward change of direction both absorbs the central axis and links the two sides. The fountain in front of the staircase features the river gods of the Tiber and the Nile as well as Dea Roma (Minerva). The upper part of the facade was designed by Michelangelo with colossal corinthian pilasters harmonizing with the two other buildings. Its bell-tower was designed by Martino Longhi the Elder and built between 1578 and 1582. Its current facade was built by Giacomo della Porta and Girolamo Rainaldi. 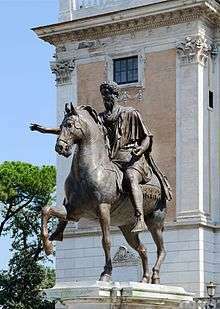 ↑ "Capitoline - definition of Capitoline in English from the Oxford dictionary". OxfordDictionaries.com. Retrieved 2016-01-20. ↑ La Regina, Adriano, ed. (2007) . Archaeological Guide to Rome. Richard Sadleir (trans.) (New update ed.). Electa. p. 105. ↑ Harper, Douglas. 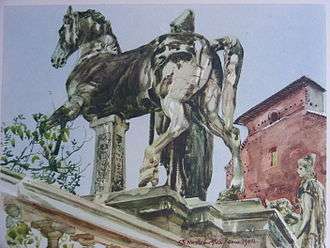 "Capitol". Online Etymology Dictionary. ↑ Hodgkins, George W. (1960). "Naming the Capitol and the Capital". Records of the Columbia Historical Society, Washington, D.C. 60/62: 36–53. JSTOR 40067217. ↑ Ancient Worlds: "Mons Capitolinus". 1 2 3 Wallace, William (2010). Michelangelo: The Artist, the Man, and His Times. Cambridge: Cambridge University Press. pp. 229–231. 1 2 3 4 5 Von Einem, Herbert (1973). Michelangelo. London: Methuen and Co. Ltd. pp. 197–206. 1 2 3 4 Morgan, Charles H. (1966). The Life of Michelangelo. New York: Reynal and Company. pp. 209–211. ↑ Giedion, Siegfried (1941). Space, Time and Architecture. ↑ Fazio, Michael (2008). Buildings across Time. Boston: McGraw-Hill. pp. 310–311. ↑ Morgan, Charles H. (2008). The Life of Michelangelo. New York: Reynal and Company. pp. 209–211.